Our wide-ranging technologies makes it possible to choose the right solution and accessories for your specific quality initiatives and inspection application. For all applications that involve paper, board or paperboard the Model 1032 and Model 1088 Splice Detector™ Solutions are recommended. 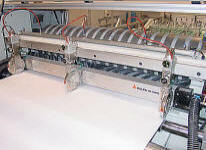 For most plastic and/or film type processes again the Model 1032 and Model 1088 solutions are recommended. If any application involves metalized material or aluminum foil, the Model 1032C Splice Detector™ solutions is recommended. For narrow web applications that are non-metallic, the Model 1099 Splice Detector™ is recommended. Applications that involve the detection of missing plies in multiply products like Tissues or Napkins, the Model 1478 Missing Ply Detector™ solutions is recommended. In short, if you have a splice detection or missing ply detection requirement, we can do the job for you hands down. All our units are auto-calibrating and are not affected by printing, subtle cost weight changes, color of splice tape, type of tape or machine speed that commonly affect photoelectric and ultrasonic sensors. We guarantee the detection of all splices 24 hours a day 7 days a week, 52 weeks a year. There is not other sensor worldwide that will deliver this kind of reliability year after year with maintenance costs averaging 0 dollars. Splice Detector Technologies also offers a wide range of accessory systems such as our Model 4000 AutoTrack™ technology that is applicable to our edge mount sensors and will facilitate the ability of the sensor to track the web edge, re-track from the web during web breaks and will follow any wandering webs to ensure detection is always constant and eliminate operational intervention. Our Model 1099 and 1042 AV technologies can be integrated with any splice detector solution to provide production with very reliable audio and visual alarming of splice fault events and can be coupled with any other control requirement. Not withstanding being the leader worldwide in splice detection sensing, we also provide very reliable control systems like our Model 1108 Watermark/Keymark Register Control Technology, Model 1109 Dandy Roll Control Technology, Model 1122 Sheeter Reject Gate Control Technology and Model 1280 Edge Marking Identification Technology. Our company also provide leading web inspection for sheeting lines with our Model 3600 FCS Sheeting Web Inspection technology. This technology is designed for coated and non-coated webs of material that require the detection and rejection of dirt, oil, bugs, coating voids, skips, coating streaks, scratches and any other type of fault that is critical to be removed from the production prior to stacking. For specialized coated webs like chrome coat we provide our specialized Model 4010 coating lump and wrinkle detector.